A Chinese Long March 3C rocket stands poised to launch China's second moon mission, the Chang'e 2 lunar orbiter, on Oct. 1, 2010. Sunday's launch of a navigationsatellite was the 12thflight of a Long March rocket in 2010, eclipsing the record for mostChinesespace missions in a single year. This weekend's flight broke anannual record Chinaset in 2008, when it conducted 11 launches of human, scientific andmilitarypayloads. This year, the country's burgeoningspace program haslaunched 12 rockets, all successfully. Payloads include four Beidounavigation satellites launched in January, July, August andOctober. Chinaplans to continue a rapid pace of Beidou flights over the next twoyears,eventually reaching an intermediate stage of deployment by 2012, whenit willprovide positioning services over China and neighboring regions. China will have launched 14 Beidousatellites by 2012 toachieve the localized coverage in the Asia-Pacific region, according toofficial government sources. Three Long March flights have orbitedYaogan militaryreconnaissance satellites, beginning in March when a trio of spacecraftblastedoff on a Long March 3C rocket. Two more Yaogan payloads, believed tobe electro-optical ornight-vision radar spy satellites, were sent into space in August andSeptember. State-owned Chinese media outletsreport the Yaogansatellitesaccomplish scientific experiments, survey land resources, estimate cropyieldsand contribute to natural disaster response efforts. But observersbelieve thespacecraft are actually operated by the Chinese military. Long March rockets in June andOctober sent Shijiantechnology demonstration payloads into orbit. The June launch of Shijian 12 starteda groundbreakingrendezvous test that reached a crescendo in August, when it approachedanother Chinese satellite. China released no official accountof the demo,but independent analysts using U.S. military tracking data concludedthespacecraft must have passed within about 600 feet of each other. Other boosters launched a Tianhuimapping satellite, theChinasat 6A television broadcasting spacecraft and the Chang'e 2 probeto themoon. Chang'e 2 launched Oct. 1 and reachedthe moon five dayslater. At least three more satellites areplanned to launch thisyear, potentially extending the record to around 15 missions by the endofDecember. China is preparing another Long Marchrocket to haul aFengyun weather satellite to orbit as soon as Nov. 4. Anothercommunicationssatellite and Beidou navigation platform could follow later in NovemberandDecember. 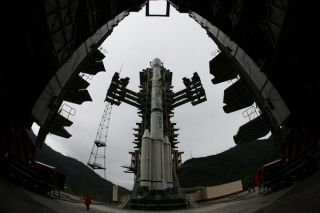 The pace of Beidou launches, coupledwith increased activityin China's human space program, should continue a frenzied launchmanifestthrough 2011. China is testing the core module of amini-space stationnamed Tiangong 1 for launch late next year. Future Chinese astronautcrews willvisit the complex starting in 2012, Hooray for NASA's EPOXI flyby of Comet Hartley 2! according to state media. This year's record launch rate comesas NASA and China opena joint dialogue on potential space cooperation. NASAAdministrator Charlie Bolden visited China last month, andhis hostsafforded him unprecedented access to human spaceflight facilities. Although the talks did not includediscussions on specificpartnerships, according to NASA, the visit provided a basis for furtherdialogue.